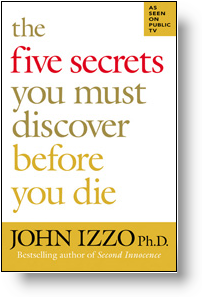 I just finished John Izzo's book, "The Five Secrets You Must Discover Before You Die" and I think it's a good choice to provide some perspective for New Year's resolutions. A simple list of the Five Secrets is useful, but the "why" really comes out in the stories Izzo shares in this book. I learned a lot of subtleties about the five secrets through the stories in each section. Izzo went down the path toward this book because he wanted to learn how to have the most fulfiling life possible. His father died at age 36, and Izzo's sense of urgency about his own life increased as a result. This study process got him to spend a lot of time with old people and he found that different cultures place different amounts of value on the old in their societies. Izzo found many cultures where the elders are held in very high regard, and regularly consulted about weighty matters - for example, he cites a Romanian saying, "The house that does not have an old person in it must buy one." He also observes that the US culture, for one, tends to focus more on the ideas of the young, and relegates elders to nursing homes and retirement communities. I think his observation is an interesting one and, while his statements about this may be exaggerated a bit, it's worth considering whether we are systematically dismissing the value of the old people in our society - and figuring out how each of us, individually, can embrace the value of our elders more often. As cool as Izzo's ideas are, one thing bothered me after reading this book: Most of the "elder honoring" cultures Izzo mentions (Romania, Tanzania, etc.) are not exactly dominating the world's stage for political, economic, or social contributions. Why not? What else is needed? And is there a way to accelerate world contributions by better engaging elders in our activities and decisions? There is a lot to think about in this book, and I think it provides an excellent backdrop for reviewing your life's priorities and purpose. If you're thinking about New Year's resolutions this would be a good book to read before you put pen to paper - it's an easy read for such a deep message, and the stories will be good for you no matter what..